The images of flooded homes that we’ve seen in recent weeks have been devastating and heartbreaking. I can’t imgaine what people have lost and have been experiencing. To lose your home, the contents of your home, to not be able to return for months on end must be excruciating. I count my lucky stars that we don’t live in a flood zone but with the weather recently that could all change of course. I know that it’s all material and can be replaced but it’s your home, it’s where you take sanctuary from the world, where you feel safe and secure and where you bring up your family. To have to leave all that and not know when you can return would be horrific. 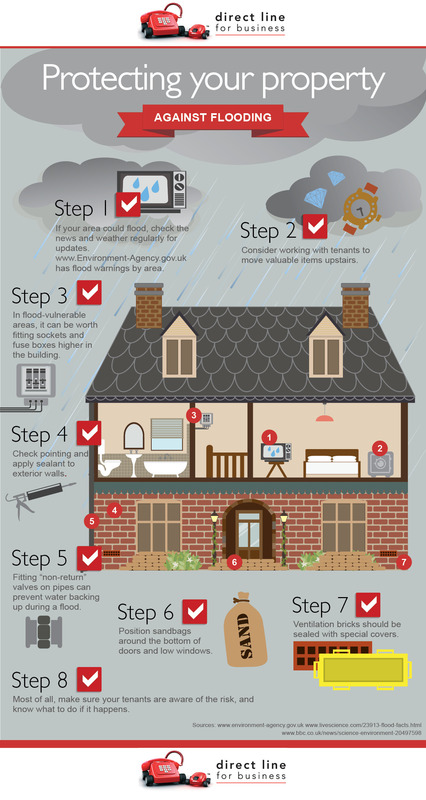 I think we would all want to know how to protect your property from flooding. Communication would be key I can imagine, talking to your tenants and ensuring they are aware of the risk. If it’s a furnished property you would want them to do as much as possible to protect the furnishings, taking what they can upstairs to a higher floor. Fitting non-return valves and fuse boxes in a higher part of the building are all realistic and achieveable and will save money and heartache in the long run.Whether you are a tenant or a homeowner, checking the Environment Agency website and watching the news and weather for alerts and updates is imperative. The water levels can rise so quickly as we’ve seen, and often take people by surprise. It’s always best to be prepared and minimise the damage if you can. I’m luck as i live in a flat but it must be devastating to have been affected by the flooding. Some people I know are landlords, I will check if they have this form of insurance, great advice! Thanks Jen for providing useful tips on protecting your home against flooding. I can understand how one feels on losing his home. Well, I am gonna share this infographic on my Facebook wall. Keep up the good work! Excellent value driven article here. Tons of information about flood. Appreciate it.